CONOR COLLINS SPRUNG to worldwide fame earlier this year when he created a portrait of the famous Vanity Fair cover of Caitlyn Jenner out of the negative tweets, above. Collins is a Manchester-based artist whose parents are both Irish, and the Caitlyn Jenner creation brought him so much positive attention from around the world. But as GayTimes.co.uk reports this week, he also received some hate mail from people unhappy with that particular piece. 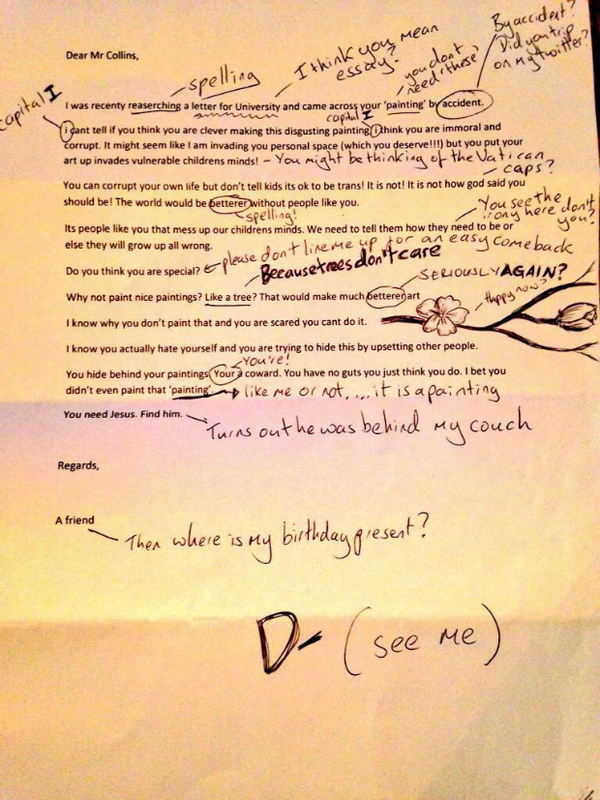 Yes, he went through and corrected every single one of the letter’s many embarrassing grammatical mistakes. I can’t remember who it was who said it but I was told that the more hate messages you are getting, the more likely you are doing something that is making change. His sensational schooling of this one correspondent has been picked up around the world today and it’s an inspiration to others. Email “This artist's response to some hate mail was spectacular”. Feedback on “This artist's response to some hate mail was spectacular”.